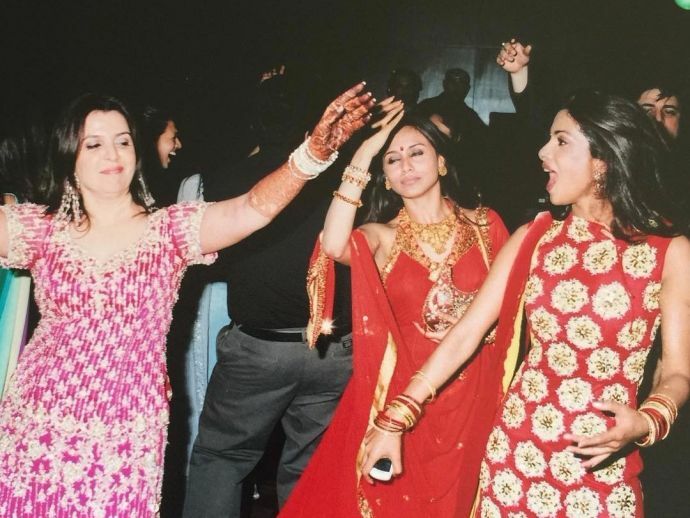 These candid pictures from Farah Khan's wedding are just WOW! Farah Khan recently celebrated her 12th wedding anniversary to Shirish Kunder and decided to share some pics with fans. The director took to Instagram to post photos, which obviously was a star-studded affair. Sajid behaving adorably naughty. Also Hrithik, Suzanne and KJo looking absolutely gorgeous! Mothering @bachchan even #12yrsago at the sangeet.. mid way between normal n tipsy???? PC wooing over the bride. Rani looking ooh la la in the red saree! Sangeet #12yrsago .. with Rani n @priyankachopra .. i do remember this outfit by @manishmalhotra05 had a dupatta.. ???? #12yrsago completely tipsy by the time @iamsrk n Gauri arrived.. thts my 3 rd std. friend Sharmila Ribeiro with us..